Increasing talk of a no-deal Brexit, as Mrs May’s Chequers proposal is dismissed by the EU, followed by a strong performance at the Conservative Party conference. Trade wars, the Kavanaugh enquiry, allegations of tax dodging against the President and uncertainty over November’s mid-terms balance against strong economic data to keep equities steady. Italy’s new government agrees a budget deficit of 2.4% of GDP, creating tension with the EU Commission. The figure is much higher than the previous forecast of 0.8% and the Economy Minister’s proposed 1.6%, and can only be justified by faster GDP growth. China was hit by an additional $200bn in tariffs from the Trump Administration as trade wars between the US and China drag on. China struck back with $60bn in tariffs of its own, and cancelled talks which had been scheduled to take place with Treasury Secretary Mnuchin. Japan’s GDP grew at 3.0% year on year in the second quarter, the fastest pace in the past two years, and higher than initially estimated. Recent Japanese data has been strong across a number of metrics including retail sales, household spending and unemployment. This is reflected in the Japanese equity market, which rose close to 5.0%, as measured by the Topix Index in Yen terms, in September. 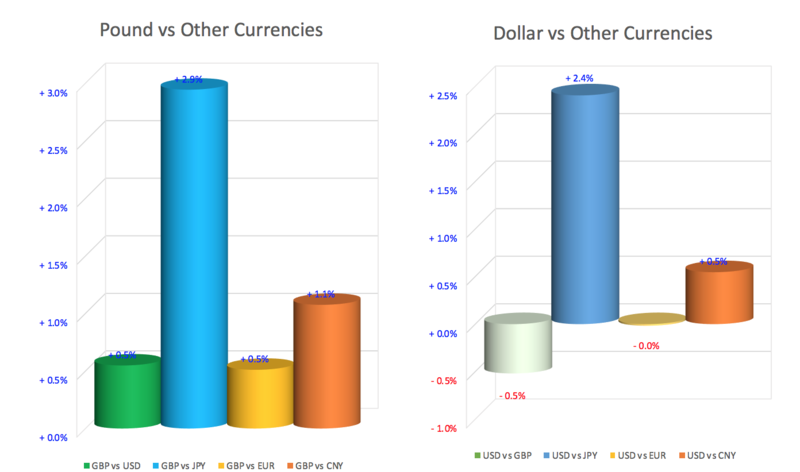 During the month, the best performing major market was Japan, which rose by 2.6% in Sterling currency terms, with US flat and UK slightly up. Japan’s Nikkei 225 index hit a 27-year high, driven by a weaker Yen. 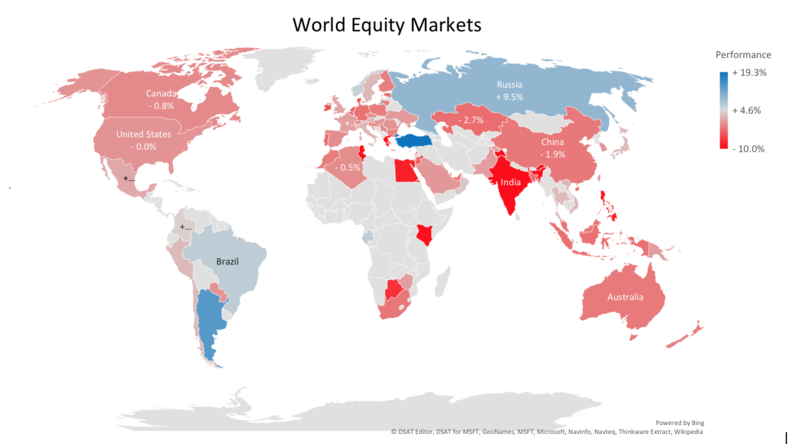 The emerging markets that have been problematical of late, Turkey and Brazil, rallied strongly, but emerging markets as a whole were dampened by falls in China and India. The latter was the weakest market in September, falling 10% in Sterling terms and the former was hit by the escalation of the Sino-US trade war. 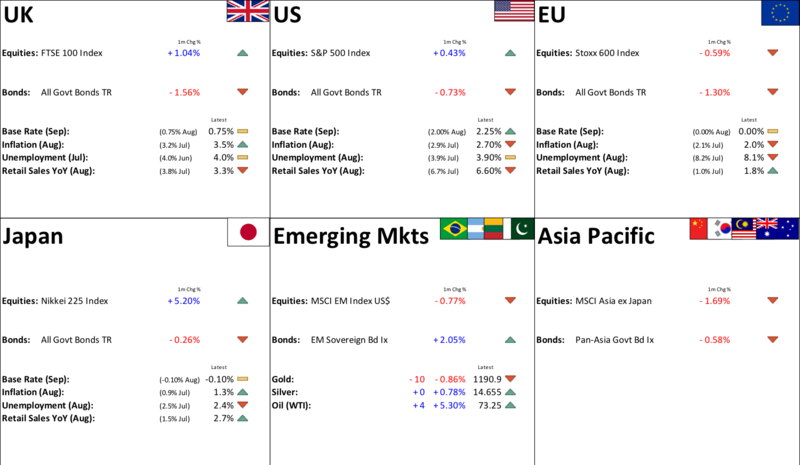 The strong Dollar and rising oil price continue to provide a headwind for emerging markets generally. September was a gloomy month for most of Europe, with falls in more than half of the EU equity markets in Sterling terms. 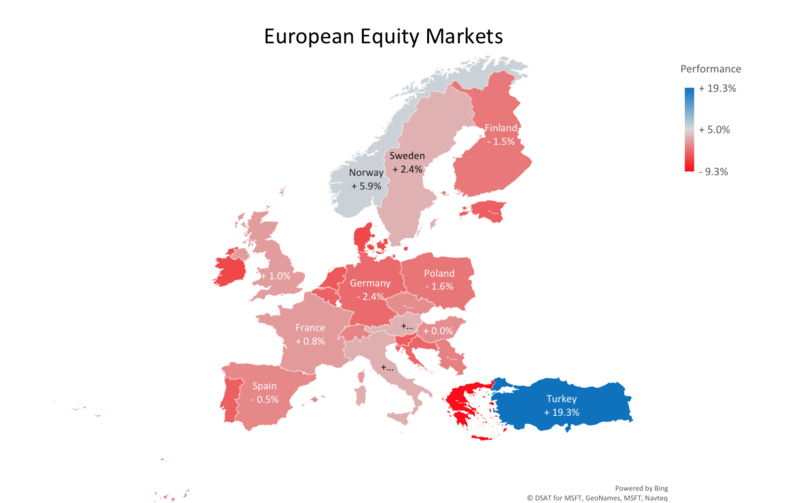 Brexit talks and political stresses saw Greece fall by 9.8%, with Italy the best performer among the major markets, rising by 2.7%, despite being the source of much of the wider European gloom. UK and France were also positive, with Turkey rebounding from its recent falls to gain 19.8%, helped by a rally in the Lira on expectations of a rate-rise. Sterling had a better month in September, as, both sides in the Brexit negotiation seemed committed to finding a solution to the current deadlock, however, it gave back larger gains after Mrs May’s Chequers proposal was rejected, and she reiterated the possibility of a no-deal Brexit. The Euro fell, as Italy’s government agreed a deficit target of 2.4% of GDP – well above the 1.6% proposed by the Economy Minister and the 0.8% predicted by the previous government. Italy is the third largest economy in the Eurozone. Despite strong Japanese economic data, the Asian currencies were weaker against the Dollar and Pound as a function of the latter’s strength. 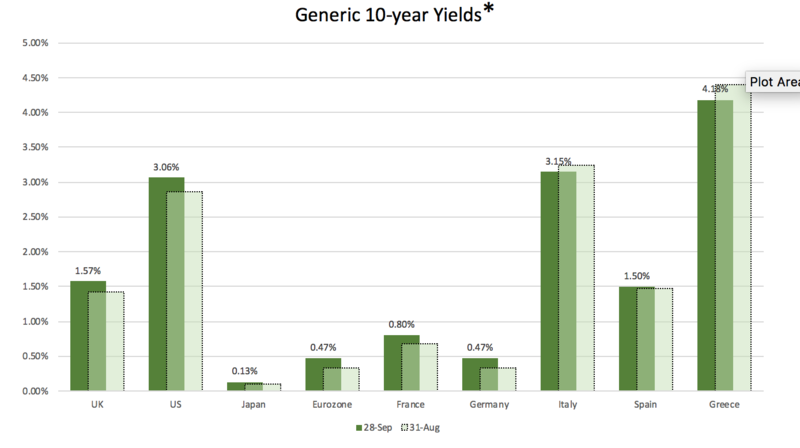 US bond yields tracked higher in September after the Fed raised its target range by 0.25% to 2.00-2.25%. UK yields moved up after a surprisingly strong inflation figure of +2.7%, vs expectations of +2.4%. Wage growth also reached +2.9%. Italy and EU peripheral markets saw yields fall, as the latest data showed confidence falling and retail sales and industrial production also down. The ECB is about to start reducing its bond-buying programme and ending QE. The US economy is growing strongly, whilst Europe and Japan have seen their growth rates slow as the year has progressed, the US grew at +2.9% in the 2nd Quarter of 2018 and an even faster rate of growth is expected for the third quarter. We have been monitoring these developments closely and this is reflected in the construction of the investment models, which reflect our approach to controlling and spreading the risk through the asset allocation and fund selection process. The US, in terms of size, is over half of the FTSE World Index and we are always conscious of the inherent risks associated in building models based on the composition of the benchmark. Our exposure to the US, whether in equities or fixed interest, reflects the combination of a positive view on the economy alongside those portfolio construction and risk management parameters. 1. Business Confidence – US businesses are very optimistic and have been so ever since the election of Donald Trump. Prior to November 2016, business confidence and activity were the missing pieces of the US recovery jigsaw. But a combination of tax reform, deregulation and sense that the President was a businessman rather than a politician, has boosted business confidence to levels even higher than under Reagan. This then feeds through into our second reason. The most recent monthly survey of Non-Manufacturing Activity, which covers 80% of the US economy, was the highest reading since the survey began in 2000. 2. Business Investment –strong business confidence is feeding through into much higher levels of Business investment and Capital Expenditure and this is coming through both in survey data on business intentions, but also the ‘hard data’ such as Industrial Production and Fixed Capital Investment. 3. Deregulation – Under the previous administration there was a huge increase in regulation and whilst there may have been sound political and environmental reasons for such legalisation, it was very unpopular with business. That is now being rolled back and is one of the factors driving the increase in business confidence and investment. 4. Inventory – the upswing in business activity has resulted in low levels of inventory across the economy. Strip this factor out and the underlying growth rate was even higher in the second quarter. We are due an inventory rebuild that will boost the economy even more. 5. Employment – The US continues to create jobs at an unprecedented rate with the weekly levels of unemployment claims back to levels last seen in the late 1960’s. If we strip out the effect of the Vietnam War draft, the rate drops to levels last seen when Eisenhower was President. We are now seeing increasing levels of job ‘quits’, as workers feel confident to move to secure better terms and prospects and the participation rate is finally picking up as ex-workers return to work. 6. Shale Energy – The huge increase in Shale Oil and Gas activity is not only boosting the economy but also moving the US towards the strategic goal of energy independence, as well as helping reduce the Trade Deficit. 7. Consumer confidence – Consumer Confidence is at record highs, reflecting the benefits of a buoyant job market as well as the one-off boost from tax cuts. Retail sales are strong and there is little sign that the political events in Washington, nor concerns over trade policy is impacting either consumer or business confidence. 8. Consumer debt – unlike the years ahead of the Great Financial Crisis, US consumers are not piling on the debts to fuel their spending. Credit Card default rates are at multi-year lows and family balance sheets are in better shape than they have been for a while. 9. Inflation – inflation has picked up, mainly due to the price of oil. But there is little sign of inflation getting out of control and wage growth has been far more subdued than would have been expected given the tight labour market. 10. Fed raising rates – this may seem a strange reason to be positive, but the US Fed is raising interest rates because it can, rather than because It needs to. The economy is strong enough to adjust to higher rates and it’s quite possible that a year from now US rates will be at 3%. This not only gives the Fed room to cut rates at some point in the future should it need to, but it also reflects the fact that the Fed is currently the only Central Bank able to embark on a policy of ‘normalisation’ of interest rates.